« Tidbits: Disco, babies, etc. 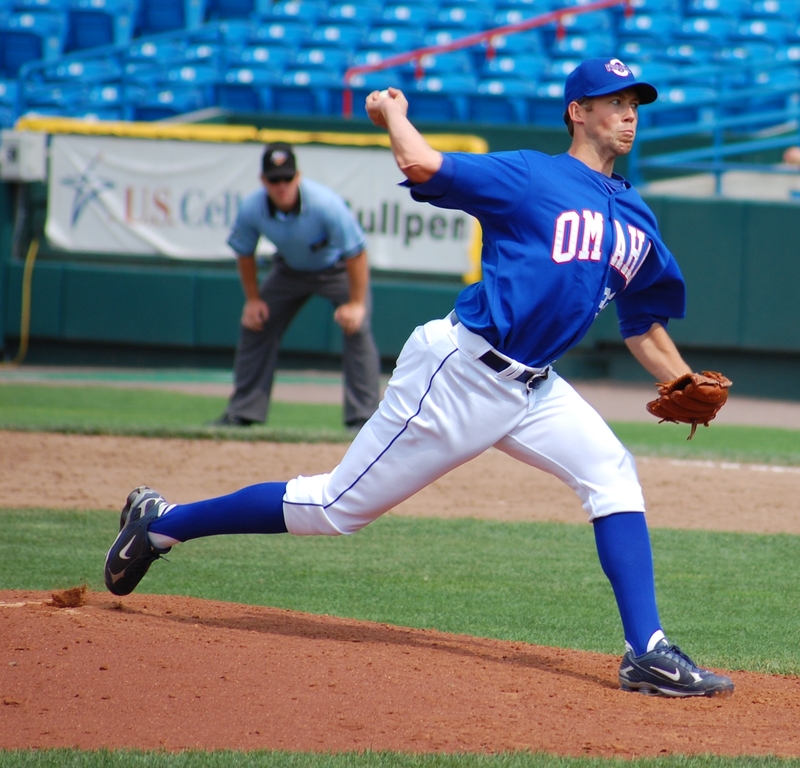 Bryan Bullington pitching sometime earlier this year. The Omaha Royals have slipped into last place in their division – they’re just 3.5 games out, but still. It makes me nervous to think that the team could slip at some point. And if they were going to slip, now would be the time they’d start; it may take a miracle to get the pitching staff through this weekend in one piece. Thursday night, the bullpen had to pitch 8 innings after Philip Humber got ejected with no outs in the 2nd. Friday, Blaine Hardy only lasted one inning, giving the rest of the bullpen another 8-inning assignment. Monday – day game/rehab start for Gil Meche. Which means the pen will need to go 6-7 innings at minimum. The team definitely needed a strong start tonight, and got just that from Bryan Bullington in game one. Home runs by David Lough and Kila Ka’aihue helped the Royals to an early 5-0 lead. New Orleans starter Joey Lawrence stayed in the game and stabilized for a couple innings. And then, the 5th inning happened. Omaha batted around, chased Lawrence from the game, and scored seven runs…before a single out was recorded. The Royals ended up scoring nine in the inning, and winning that game 14-2. Though the fans in the front row may have gotten tired of giving us high fives after so many runs, it sure didn’t get old to me. The 5th was a heck of an inning, and I had a blast. 39 pitches thrown. I figured this number would be higher, but a lot of guys got their hits on the first or 2nd pitches. It was delightful, especially given that the 5th was the inning in which a child got to be the guest PA announcer. Today’s kid is officially a grizzled veteran of stadium announcing by now. Bullington pitched the whole game, providing much-needed relief for the bullpen. The second game didn’t go so well, as Omaha lost 8-1. Federico Casteneda had a scary moment when a line drive appeared to catch him in the…pants. He’s OK, though. He and Manny Baez split the struggles pretty evenly in the loss. Sunday’s doubleheader starts at noon. Or started, depending on when you read this. Here’s hoping the pitching staff holds up.